We know how critical uptime is to your success. 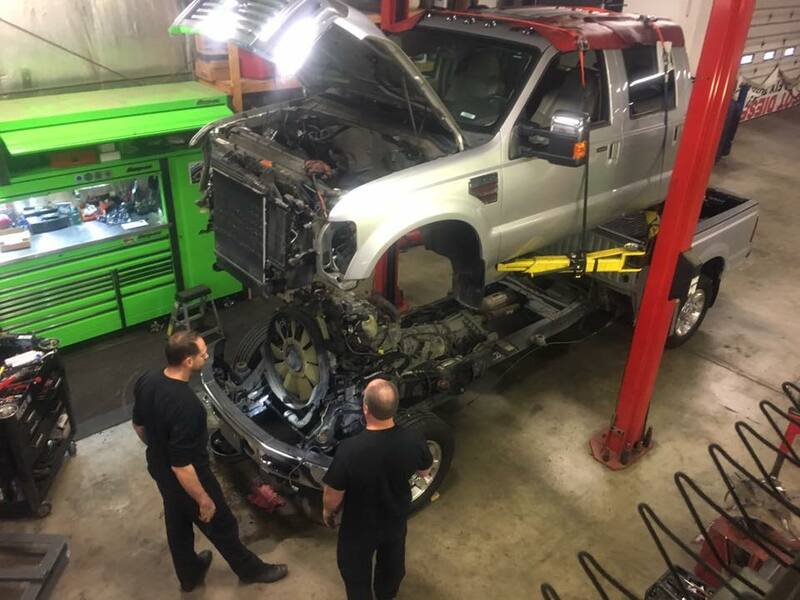 When a light comes on or an engine goes down, our service team quickly responds to resolve the issue and get you back on the road as quickly as possible. Running low on fluids? Need diesel particulate filter cleaning service? We perform routine tune-ups to keep your engine running at maximum power and efficiency. Running at low power? Service light on? 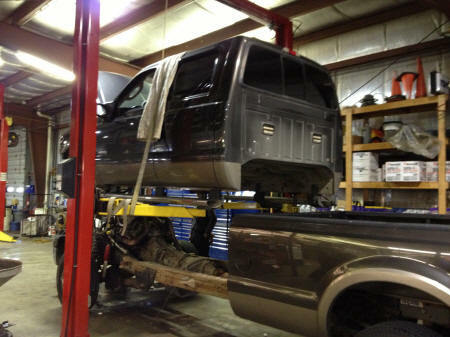 Our diesel service center can quickly identify service issues. Problems with an EGR valve? Leaking oil? 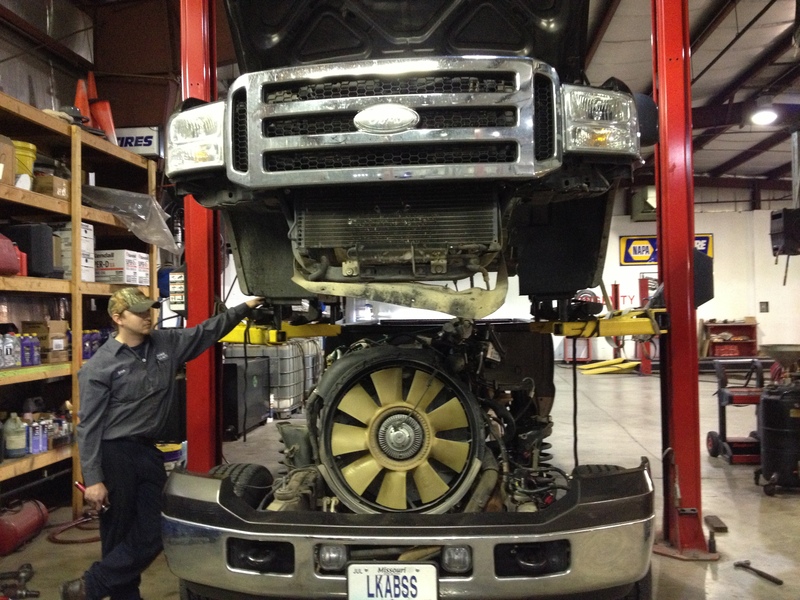 Our certified diesel mechanics are trained to identify the problem and fix any diesel engine. Not ready to invest in a new truck? We can break down, clean, service, repair, and re-assemble your failing engine block to prolong the lifespan of your diesel engine. Diesel engines require parts that are heavier and stronger. At Sparks Tire & Auto in St. Charles MO., we occasionally service diesel cars and trucks with over 300,000 miles/500,000 kilometers. The heavy-duty parts make diesel vehicles a little more expensive new, but due to the extra burliness, diesel engines last a lot longer. This is one of the reasons Cummins diesels inspire such a loyal following. Cons? Cold weather starting. Diesel engines can be hard to fire up when the temperature drops. However, an engine block heater can solve this problem. Talk to your friendly and knowledgeable Sparks Tire & Auto service advisor for more information. Bottom line? The diesel vehicles on St. Charles roads today are not your grandfather's diesel. When someone mentions diesels around St. Charles, images of smoky, rattly trucks may spring to mind. The fact is that the modern, clean diesel engine is much more refined than in the old days. Sure, diesel engines remain a very popular choice with heavy duty pick-up truck drivers in the St. Louis area, but they are finding their way into nearly every segment of the automotive market. Why is that? Well, it's science. Diesel fuel contains more energy than the same amount of gasoline. So it takes less diesel fuel to do the same amount of work as gas. so St. Charles diesel drivers get more miles per gallon/kilometers per liter and lower emissions. In Europe, where fuel is very expensive and good fuel economy is very important, around half of passenger vehicles are powered by diesel engines. This goes for small economy cars all the way up to the world's most luxury vehicles. The driving experience is also very good with diesel engines. In fact St. Charles residents may not even be able to tell the difference between riding in or driving a diesel powered vehicle. So what are the factors to when deciding whether or not to choose a diesel engine? One consideration is price. Diesel engines cost more to build and are an extra cost option for most vehicles. So St. Charles residents need to do the math to see how long it will take the increased to pay for the extra up-front cost of a diesel engine. The cost of diesel fuel in Missouri is also a factor. There is no clear correlation between gas prices and diesel prices because the refining and distribution systems are so different. This means that the difference in price per gallon/liter for diesel and gasoline can vary a great deal depending on where you live in Missouri. Just watch diesel and gas prices for a while (or talk with a diesel owner in St. Charles) so you can get a feel for how much price per gallon/liter figures into your purchase decision. Also important to know is your expected use of the vehicle. For example, if you tow heavy trailers or haul heavy loads around St. Louis, the extra power many diesel engines offer (while getting better fuel economy than a gas engine) may help you make your decision. Your highway/city driving mix may play into the decision as well. Diesels shine in the highway fuel economy department. And the more you drive in a year, the more attractive diesel engines become. If your vehicle has a diesel engine, remember that it still requires maintenance like your gas powered vehicles always have. Oil changes, cooling system service, power steering, brakes, tires, etc. – all need to be maintained. Some of the schedules may be different because of the unique design of diesel engines. Your friendly and knowledgeable Spark's Tire & Auto will be able to help you properly maintain your diesel vehicle, helping it last longer and continue to deliver great performance and efficiency. What's up with Diesels in St. Charles? Diesel-fueled vehicles haven't been as popular in the North American markets like Missouri. But that won't be true for long. North Americans are seeing a lot more diesel-fueled vehicles on the road. And we're not talking about buses and trucks. These vehicles will be passenger cars, pick-ups and SUV's. But that high sulfur content is now a thing of the past. Fuel producers are now required to sell cleaner diesel fuel in St. Charles. That opens the North American market to more diesel-powered vehicles. The second reason we're going to see more of these vehicles in St. Charles is that they're more fuel-efficient than their gasoline-powered counterparts. Diesel fuel has higher energy density than gasoline. That translates to more power per barrel of fuel. In your tank, that translates to better engine performance and about 20% better fuel economy. People in St. Charles may associate diesel engines with black smoke, noise and a definite “shake, rattle and roll.” That's also a thing of the past. Modern diesel engines are smooth, quiet and produce cleaner emissions than gasoline engines. Also, forget that three-second wait behind a diesel vehicle at a stoplight. Modern diesels are just as quick to accelerate as other vehicles on St. Charles roads. Bio-diesel can be manufactured from vegetable oils, including used cooking oil from St. Charles restaurants. Just think, one day you could fuel your vehicle on stuff that was once considered waste—one step closer to a cleaner environment here in Missouri. And if you think hybrid cars are environmentally sound, consider what a diesel-electric hybrid could mean. St. Charles drivers who are considering buying a diesel-fueled vehicle should know that preventive maintenance and inspection schedules are different for a diesel engine than a gasoline engine. Diesel fuel is harder on emissions systems than gasoline, so the filters and other devices have to be changed and checked more often. Also, the fuel injection system operates at much higher pressures for diesel than for gasoline, so keeping it clean becomes a higher priority. When you switch from a gas vehicle to a diesel, you'll have to learn some new rules of vehicle care. But you won't be alone. Most St. Charles service centers are aware that diesels are coming to North America and are already prepared to provide service for diesel engines. 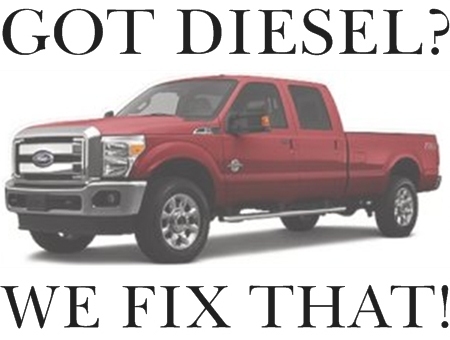 At Sparks Tire & Auto, we are well-versed in diesel technology. You can rely on our team of automotive professionals to provide quality service for diesel-powered vehicles.